The flexible Mobita® system is fully integrated with AcqKnowledge, records up to 32 channels of EEG data at up to 2K s/s, is battery operated, and fits in the palm of your hand. Record many different signal types…simply disconnect one header and snap on a new configuration for a completely different application. Swappable ConfiCaps—Quickly change the electrode configuration or signal type by swapping out the ConfiCap configurations of the inputs for specific applications (i.e., 32-ch EEG, EMG, or combinations of ECG/EMG/EEG, etc. ), customize your own design or create research protocol driven configurations. Each channel is unipolar (single ended) and AcqKnowledge is easily configured to create unique montages and combinations of signals. Record a 12-lead ECG while recording EEG and EMG data all with the same device. With AcqKnowledge and Mobita, the system is quickly configured to do the work of multiple systems without the added cost of multiple amplifiers. Mobita is battery operated, rechargeable and its compact size, integrated WiFi connectivity and impressive flexibility combine to create the ultimate solution in a mobile physiologic measurement device. Note: The number of channels enabled does NOT significantly influence battery life. Rugged construction makes the Mobita system well-suited for tough and demanding measurement situations like sports, movement analysis, brain-computer interfacing, home-based ambulatory testing and more! The device includes a trigger channel that can be used to synchronize the system with other devices or data streams. When the onboard accelerometer is used with AcqKnowledge‘s Actigraphy feature, it is possible to evaluate a subject’s activity levels. 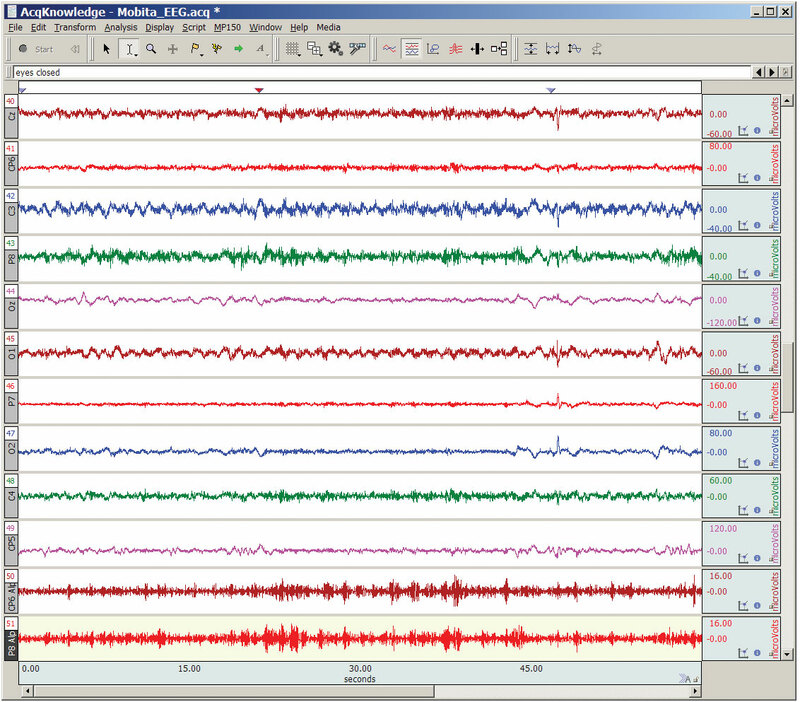 Powerful automated analysis routines for EEG, ECG, HRV, EMG, EGG, and many more! OS—must be running Windows 8 (requires Network Configuration with administrator privileges) or Windows 7 64-bit with a Core i5 or a Core i7 processor; no support is provided for operating systems older than Windows 7. Processing speed—When reading in the data from the logs on the Mobita device, if the computer is not fast enough it may not be possible to keep up with the Mobita and the transfer may fail. Slower computers may be able to use WiFi mode with the Mobita, but it may not be possible to import the logs. Privileges—Administrator privileges are required for installation to run the Mobita Configuration Utility. The configuration utility is used to avoid creating a conflict with other network(s) already on a machine; other methods of configuring a Network for a Mobita device are not recommended. Interface—ASUS USB NIC (provided dongle) is mandatory for communication with a Mobita device.